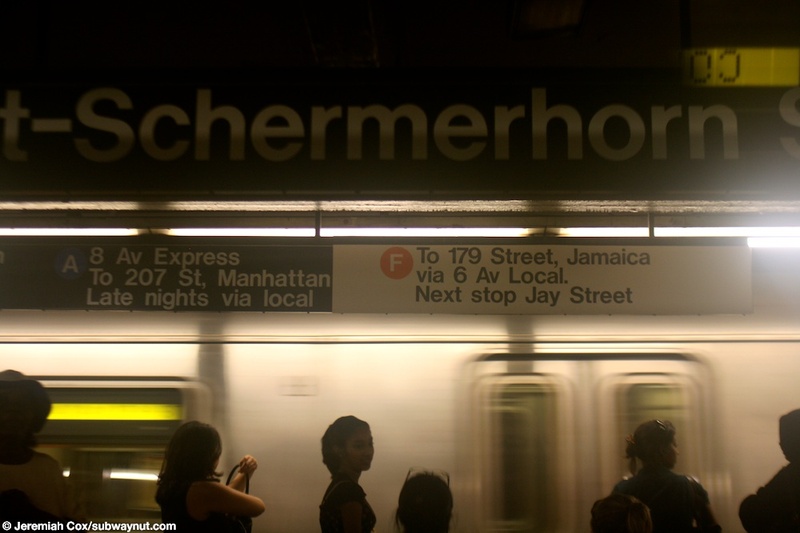 Hoyt-Schermerhorn Streets is a very unusual IND express station and across platform transfer point between Fulton Street Line A,C trains and Crosstown Line G trains. 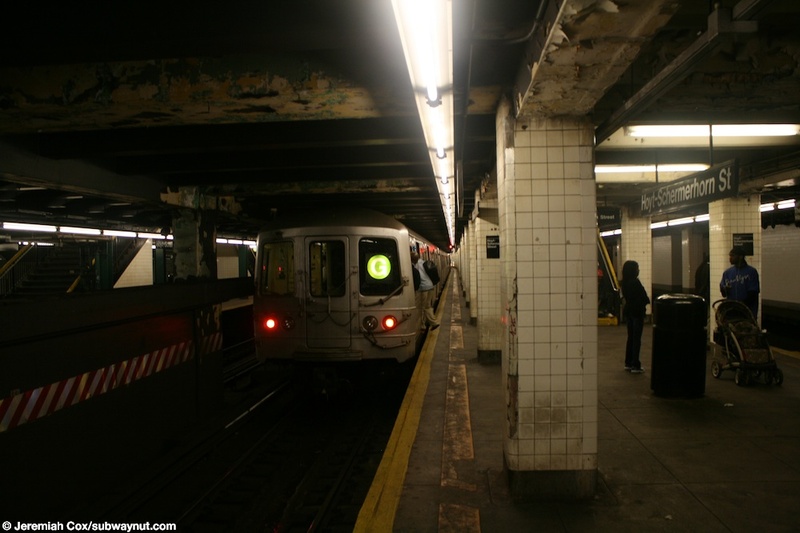 The station has four island platforms and six tracks in total, with only the central four tracks and two island platforms are currently in use. 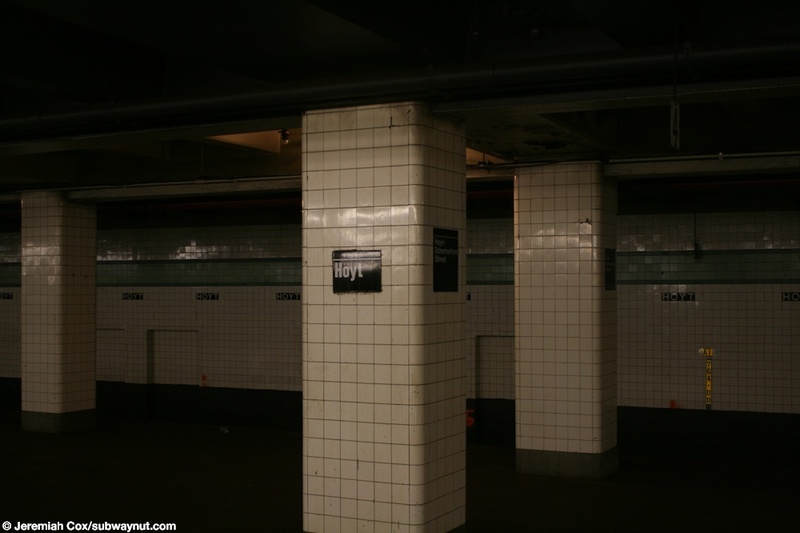 The outer two island platforms (The A,C trains platform at both tracks) and wall tracks are permanently closed and only saw about ten years of service for the Court Street shuttle, to that IND station that is now the transit museum. The tracks do see service at times for movie shoots and the station name tiling beneath the wall trim has been known to be for other stations from time to time courtesy of this. 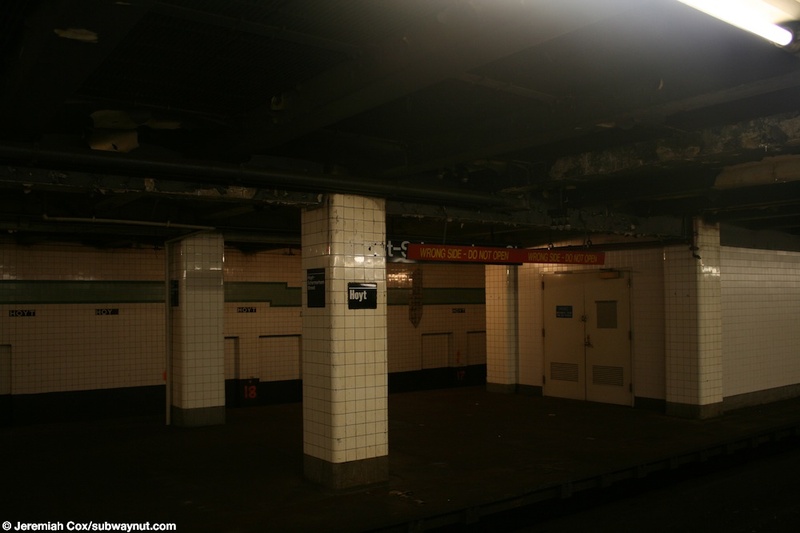 The station's former large full mezzanine have been cut apart in a completely ridiculous manor, now with a NYPD transit police station and other non-public areas. There are two staircases up from each platform to a small mezzanine towards the middle of the platform to where the station's only fare control area is, after fare control narrow passageways lead in either direction along one side of the former full length mezzanine to a single staircase at each end up to street level to exits along the north side of Schmerhorn Street near either Hoyt Street or Bond Street. 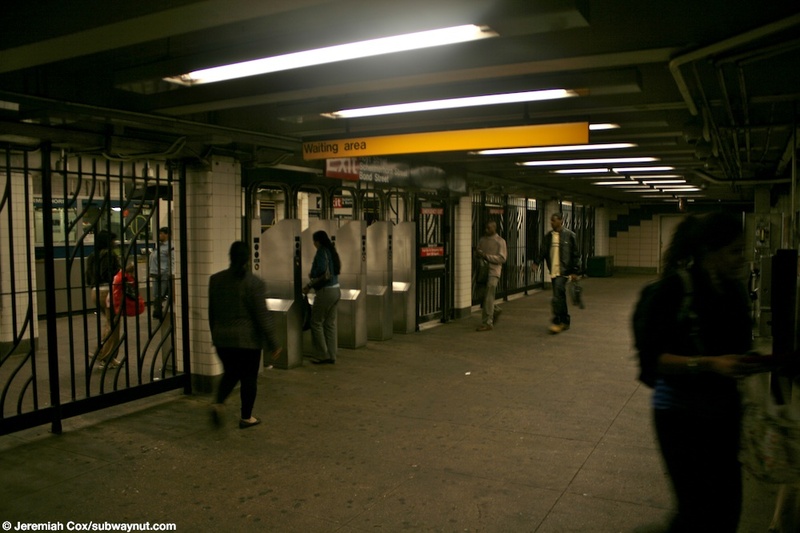 Unusually, each of these exits is set at street level within buildings. 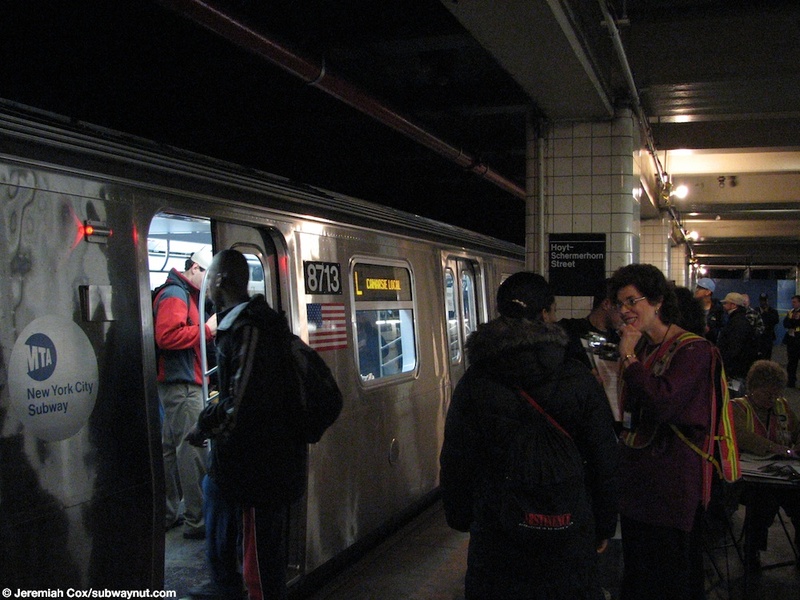 (hoyt_schermerhorna1) Looking across to the opposite platform at Hoyt-Schermerhorn Streets as lots of people wait for the G train. 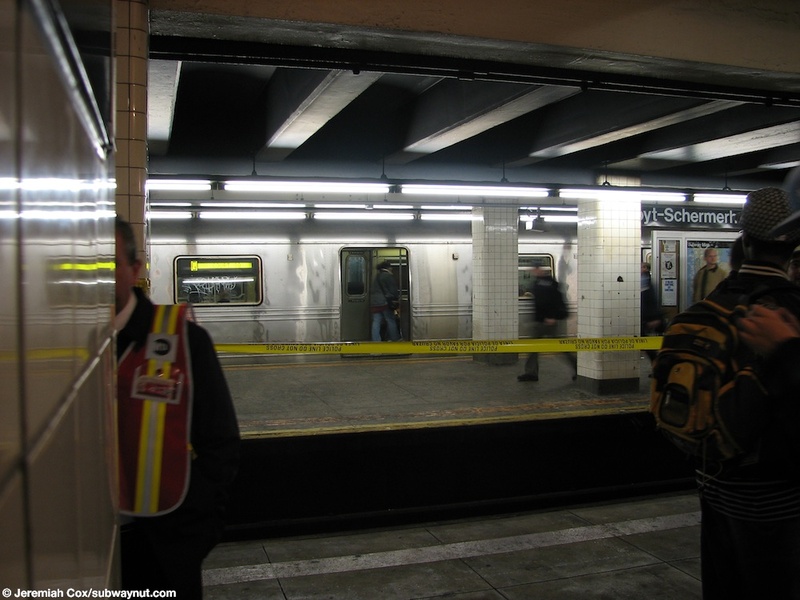 15 October, 2005 (hoyt_schermerhorna2) Looking down the G train's track at Hoyt-Schermerhorn Streets, the Smith-9th Streets bound track has been taped off since G trains aren't running there but are running in two sections between Hoyt-Schermerhorn Streets and Bedford-Nostrand Avs, (do to single tracking) and regular service north of Bedford-Nostrand Avs. 15 October, 2005 (hoyt_schermerhorna3) One of the unused shuttle platforms at Hoyt-Schermerhorn Sts is currently in use demonstrating the R160s FIND system to the general public. 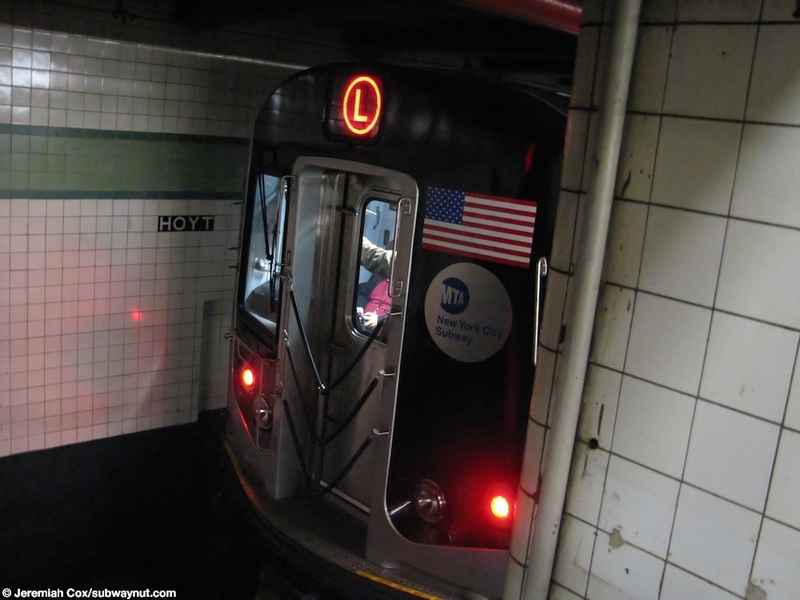 (hoyt_schermerhorna5) Passengers enter the one open car of the R160s to look at the FIND display that shows the next station stops that is being demonstrated inside of it. 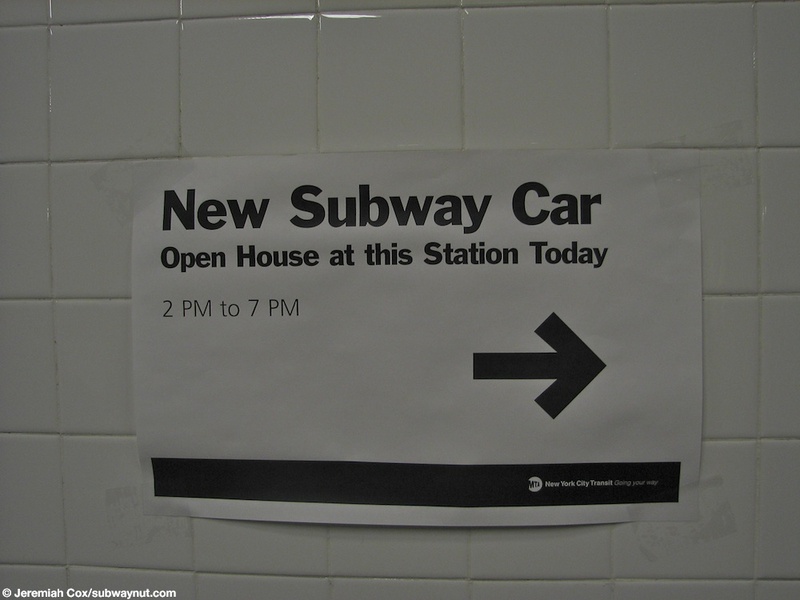 11 November, 2005 (hoyt_schermerhorna6) A sign a wall directing people to the new subway car open house at Hoyt-Schermerhorn. 11 November, 2005 (hoyt_schermerhorna7) R160B #8713 on the Queens-bound abandoned side track at Hoyt-Schermerhorn Street, at an open house to introduce the new FIND station display system. 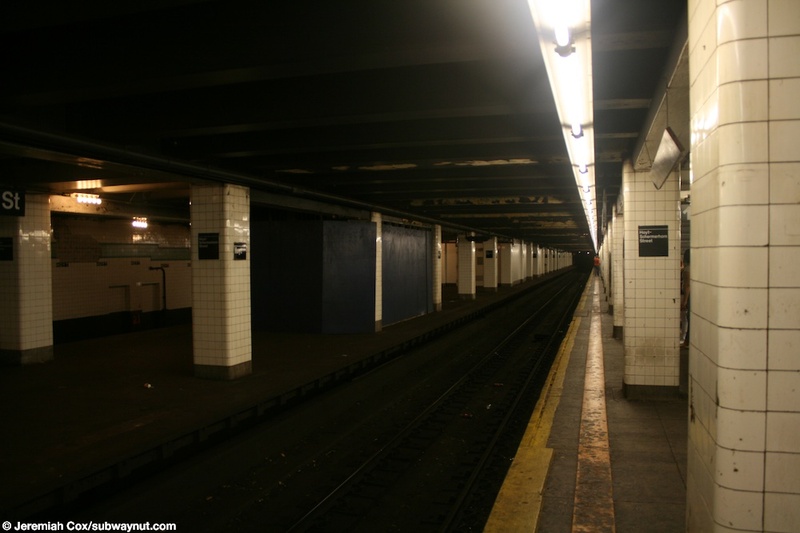 (hoyt_schermerhorna9) Looking across to one of the dimly lit closed side platforms at Hoyt-Schermerhorn Streets. 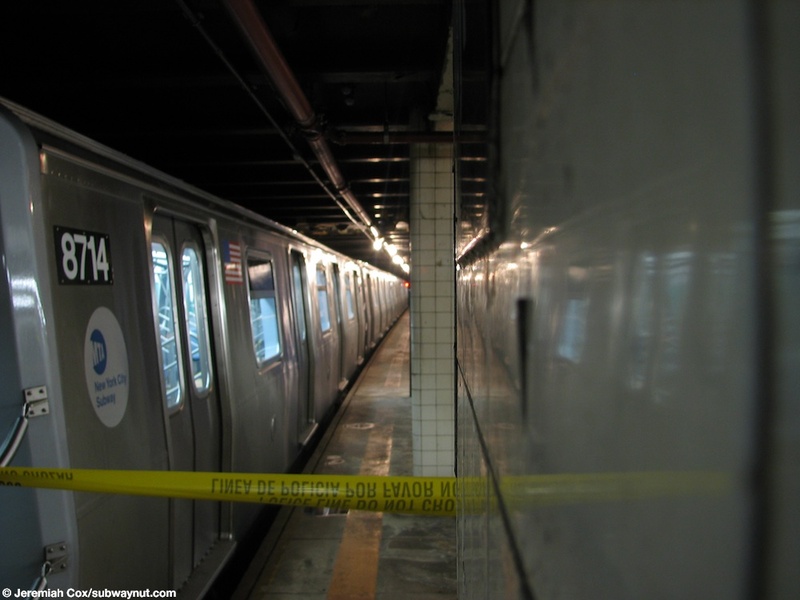 1 June, 2009 (hoyt_schermerhorna10) Looking down the Queens-bound A/C Fulton Street track at Hoyt-Schermerhorn Streets. 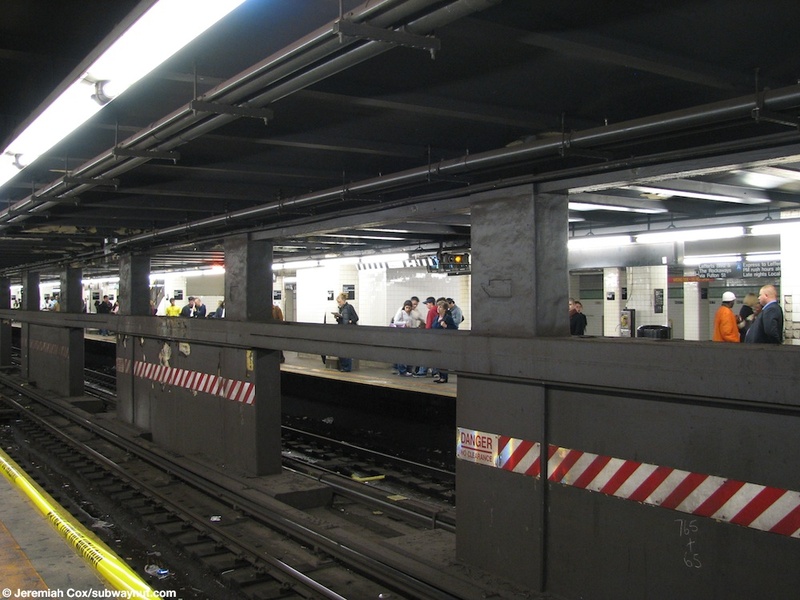 It platforms on both the used island platform and abandoned Court Street Shuttle island platform. 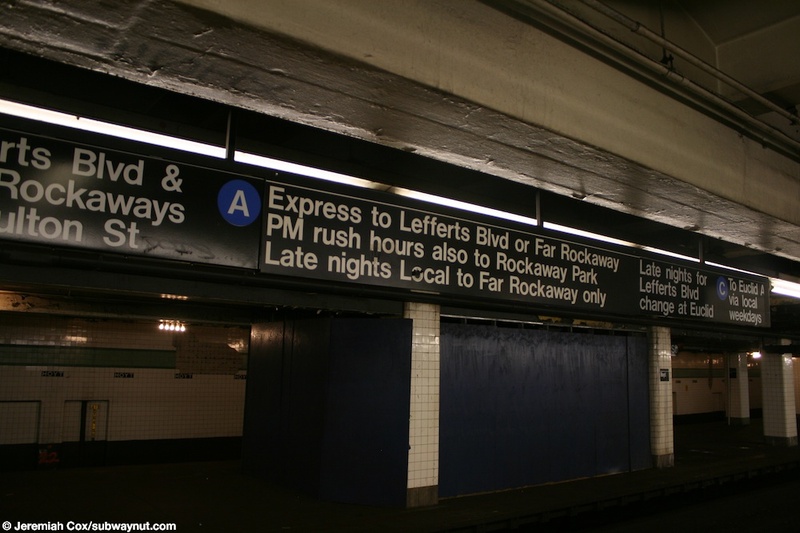 1 June, 2009 (hoyt_schermerhorna11) The long sign for service on the Lefferts/Rockaways-bound Fulton Street track, it even says Late Nights transfer at Euclid for Lefferts Blvd. 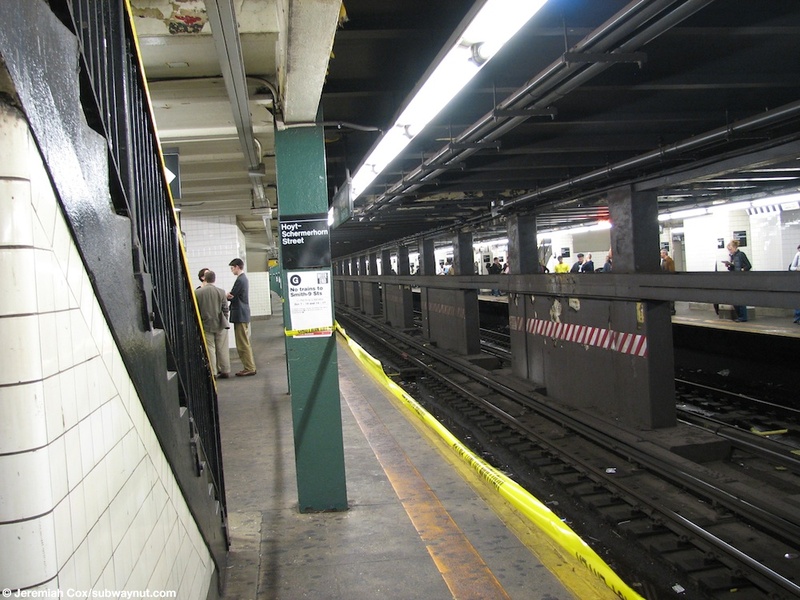 1 June, 2009 (hoyt_schermerhorna12) Looking across the Crosstown Line G tracks at Hoyt-Schermerhorn Streets. 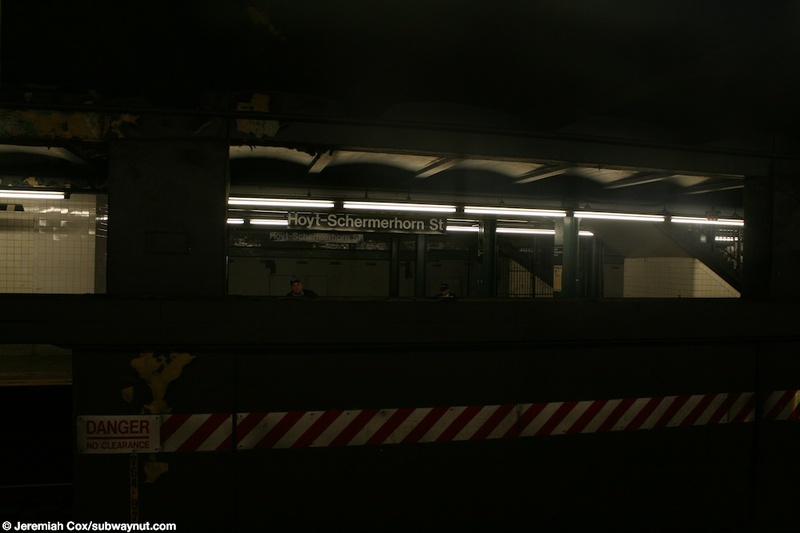 (hoyt_schermerhorna13) There is a sign on the abandoned platform at Hoyt-Schermerhorn Streets saying Wrong Side-Do Not Open. 1 June, 2009 (hoyt_schermerhorna14) The back of a 4-car R46 G train stopped at Hoyt-Schermerhorn Streets. 1 June, 2009 (hoyt_schermerhorna15) Inside with the only fare control area at Hoyt-Schmerhorn Streets with the relatively small bank of turnstiles visible on the formerly huge mezzanine. 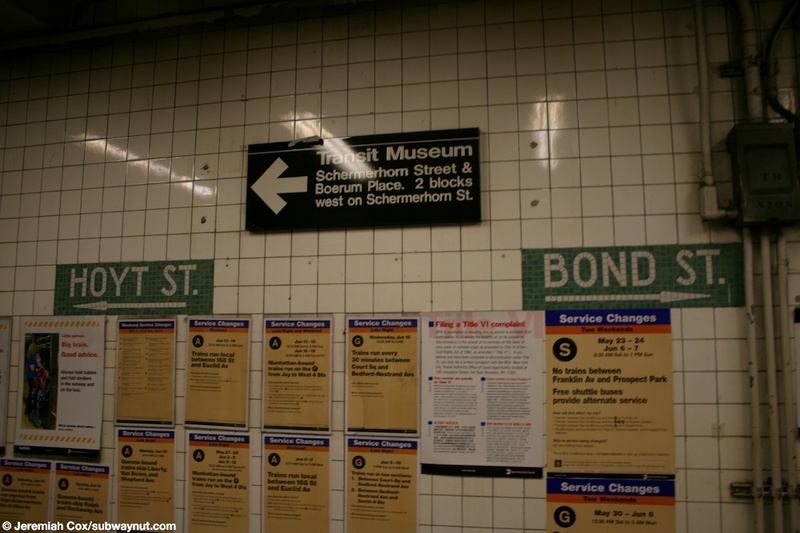 4 June, 2009 (hoyt_schermerhorna16) Mosaic signs beyond fare control at Hoyt-Schermerhorn Streets for the exits to Hoyt St or Bond St, and a sign for the transit museum in the abandoned station that used to have a shuttle connection at Court Street, only two blocks away.